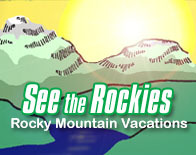 Why advertise on the See The Rockies website? For almost 20 years, Interactive Broadcasting Corporation has pioneered the effective use of internet technology, earning a reputation as an innovative leader in the development and application of this technology for tourism and recreation related businesses. As the creators of the See the Rockies, the award winning BC Adventure Network and a family of Western Canada Vacation sites and free online digital Vacation Guides, we provide the tourism industry with some of the most targeted and cost effective advertising and marketing tools available. See the Rockies is an important part of our successful tourism products and online internet services and we invite you to participate. Given the prominence of the Rockies Region in the minds of millions of vacation planners world-wide, and the promotion power we can deliver through our networks annual audience of a million vacation planners and travelers, www.seetherockies.com is definitely a cost-effective, must-add to your advertising portfolio. If you are a tourism operator, tour guide or resort, hotel or lodging provider, we'll introduce your business to the world! Let us help you market your Rocky Mountains Tourism business.